Working at our Amish Prairie Mission L-Desk with Hutch Top will really give you the space you need to spread out and stay organized at the same time. An L-shaped desk fits a corner perfectly and is a solid wood desk that offers the most work space, making it an excellent candidate to support multi-tasking. House your computer on one side and set up your paper files on the other. With plenty of built in storage, there's room for books, manuals, office supplies, documents and personal items to be stored. The Prairie Mission includes a power supply drawer that comes in handy for organizing multiple power cords. One pencil drawer, two storage drawers and one file drawer are all built for business and are handcrafted to stay strong and support the weight of drawer contents. Add the spectacular solid wood hutch top for more storage and organization. This wood hutch offers adjustable shelving allowing you to create the configuration you need along with the option to add glass or wood doors. A task light illuminates the display. Select the wood and stain you like best for this mission desk. Mission style furniture like the Prairie Mission keeps it simple, providing a classic form without any fussy extras. Browse more of our mission style furniture for other areas of your home. 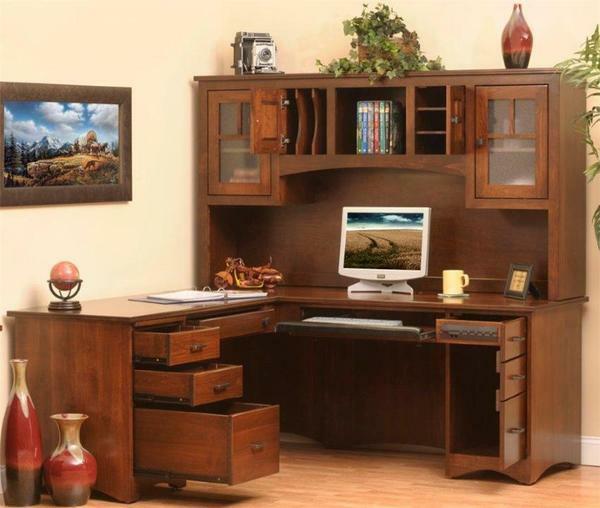 Be sure to check out the Prairie Mission Bookcase to use with this solid wood office furniture. Left Wall Width: 71 3/4"